Janine and I have work in this survey show in the Blue Mountains City Art Gallery through December 2018 and January 2019. 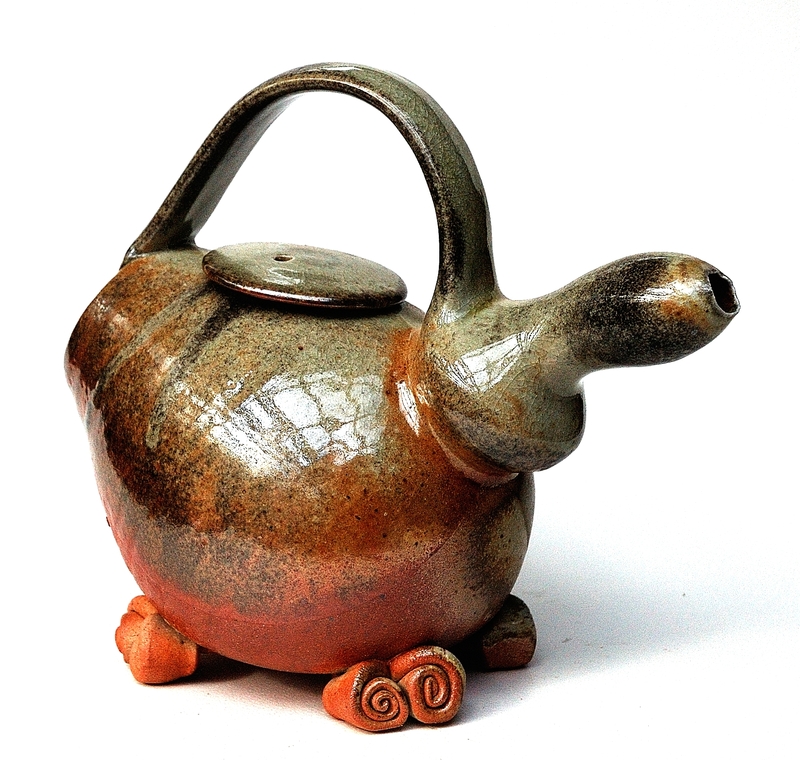 This show celebrates the work of Peter Rushforth and his students. This is my major show of single-stone sericite porcelain. 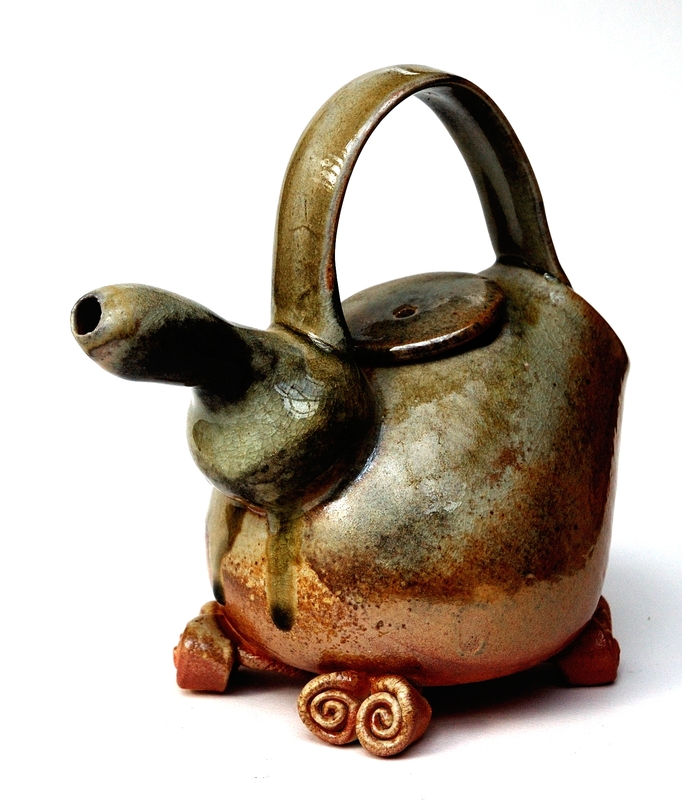 I have been researching this little known technique of porcelain making for the past 15 years. I have travelled to 11 sites in 5 countries where this ancient technique is still practiced. 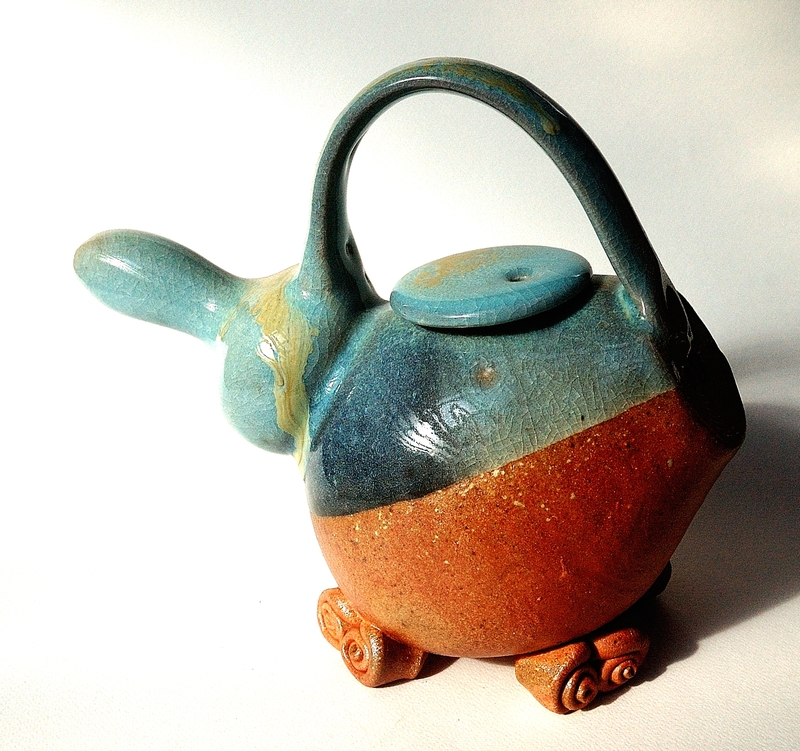 I have written a book about my research, also called ‘5 Stones – a ceramic journey’. The exhibition also got a review in ‘The Australian’ newspaper on the 24th of August 2017, by Christopher Allen. I hope that this link stays alive for some time. If not, here is an image of the review. The show has been very successful as far as I’m concerned. It has been well attended and well supported by those who have visited. 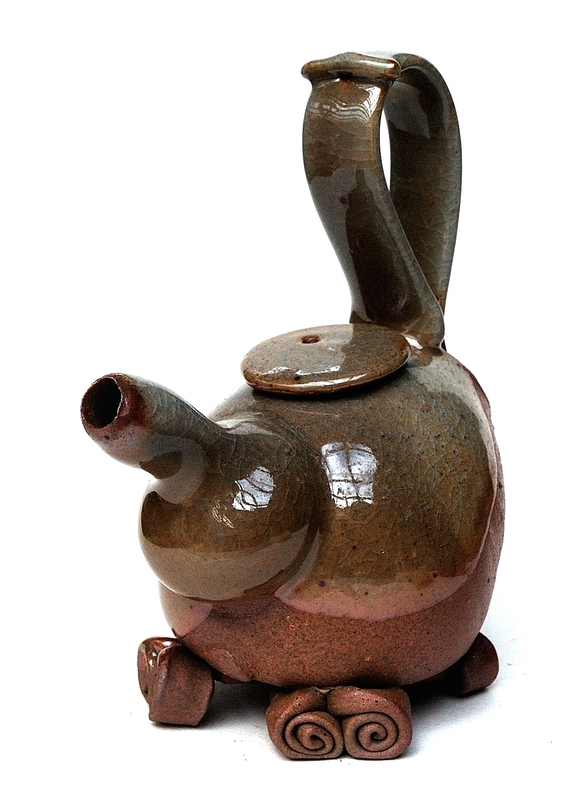 Even a few customers who have phoned , or emailed in from overseas to purchase pieces. The exhibition closes on Saturday the 2nd of September. Some of the pieces in this show are totally unique and can never again be made, as the source of the stones is now lost forever. We live in an age of instant access to information and news, except that it’s all mostly bad. I’ve stopped watching the news. It’s all too depressing. I don’t want to be ‘connected’ to this. I want my interactions to be quiet, peaceful and positive. I want to choose a constructive, creative, engagement with my environment and the people around me. I have spent my life developing a philosophy of minimal consumption and self-reliance. I believe in not buying anything that I don’t need and not throwing anything away that isn’t fully worn out. 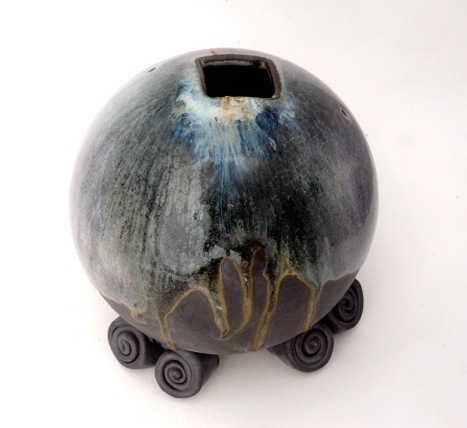 This has been part of an exploration of how it might be possible to live frugally and gently in a faster, noisier and bigger world of seemingly senseless and excessive consumerism. My Partner Janine King and I work in isolation, making only what pleases us. This is not good business practice, but we don’t think of ourselves as being in business. We are trying to live an independent creative life, that is sensitive to our surroundings, gentle on the earth, low-carbon and low-impact on others around us. We are attempting to live this life of small monetary rewards, but high satisfaction and so far it seems to be working out OK for us. I work with the raw materials that I can find around me in my immediate locality and then research and test them, to attempt to discover what interesting qualities they exhibit and then try to make original ‘location-specific’ works from them. I find this approach most fascinating and very rewarding. 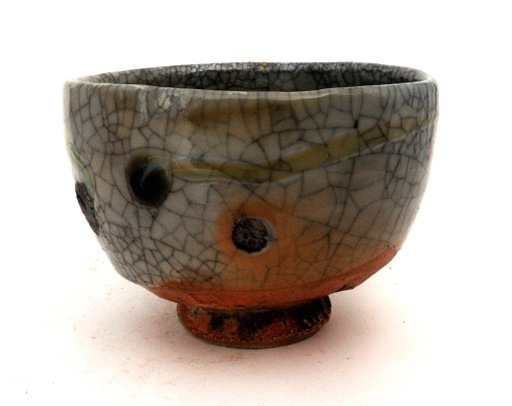 I have discovered a single-stone native porcelain, and developed a body from it that is very beautiful, especially when wood fired. I have also found and developed a single-stone, washed basalt gravel, blackware body that is gorgeous. These two special materials are the result of a lifetimes research. Not much to show for a life, but I continue to create these Senseless Acts of Beauty, because it pleases me. I am under no illusions. I know that I could not have lived this quality of life without Janine as my partner to help me achieve it, but most importantly, we have been very lucky to have lived this simple, artistic life in Australia, where there has been no civil unrest. 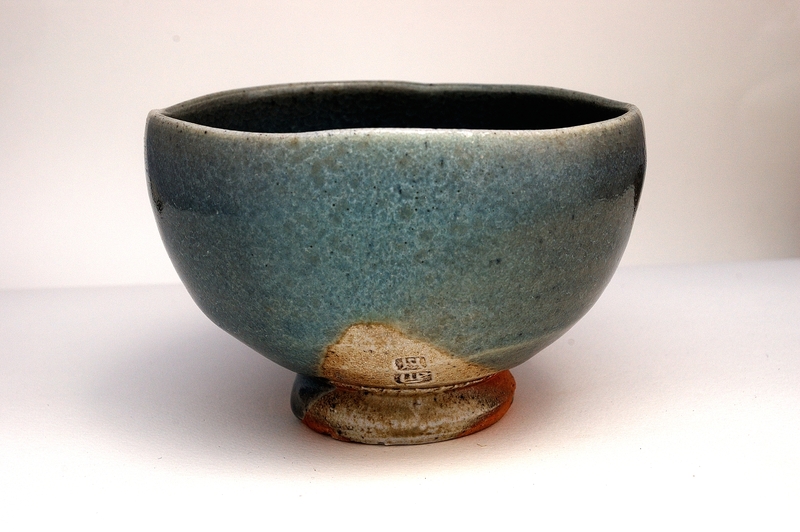 It has been my intension during my career to make simple, elegant, and hopefully beautiful bowls. 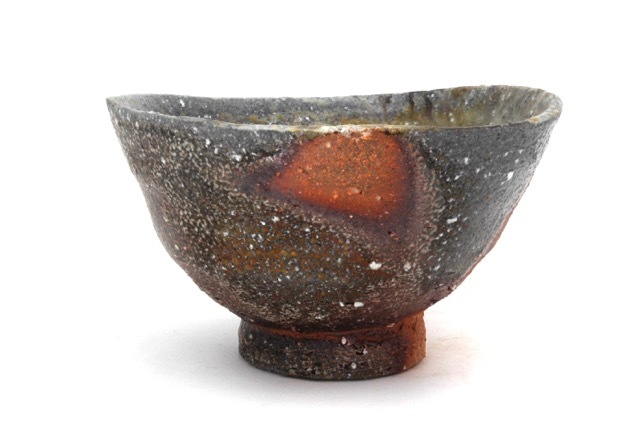 These bowls have been significantly influenced by Japanese and Chinese aesthetics as well as the Japanese culture of tea and Zen Buddhism I’m not a Buddhist. 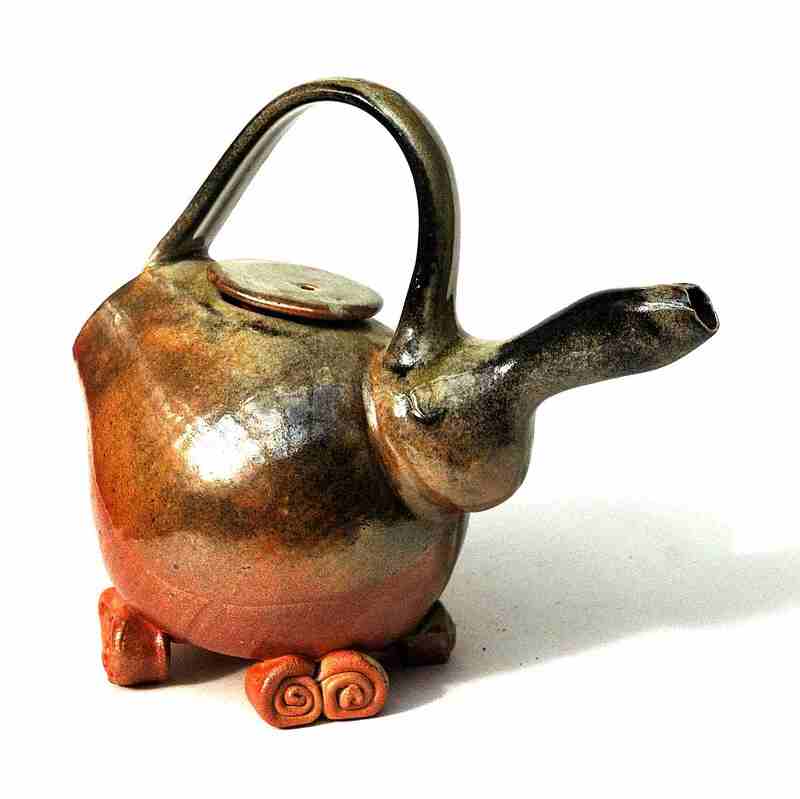 But some of the thinking around Zen practice has influenced my quest to live a simple, non-consumerist, low-carbon life. When I was studying the origins of single-stone porcelain in Japan recently. 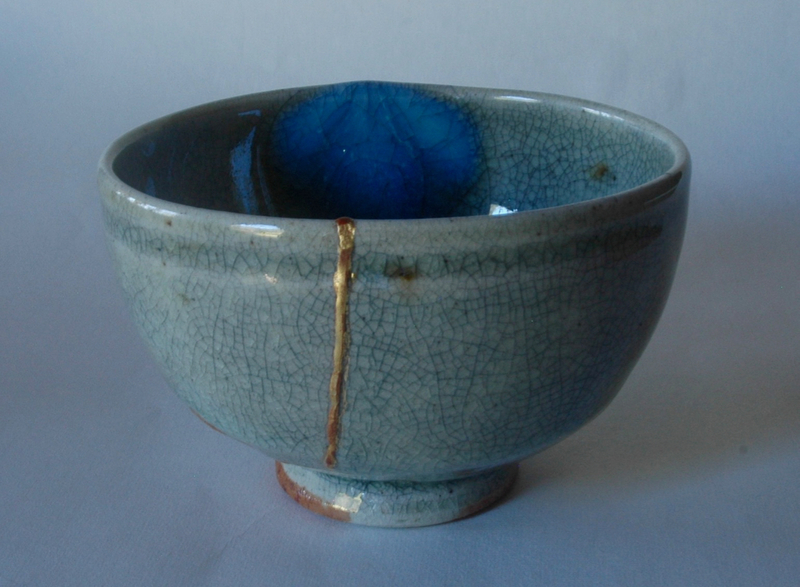 I did a course in Kintsugi. 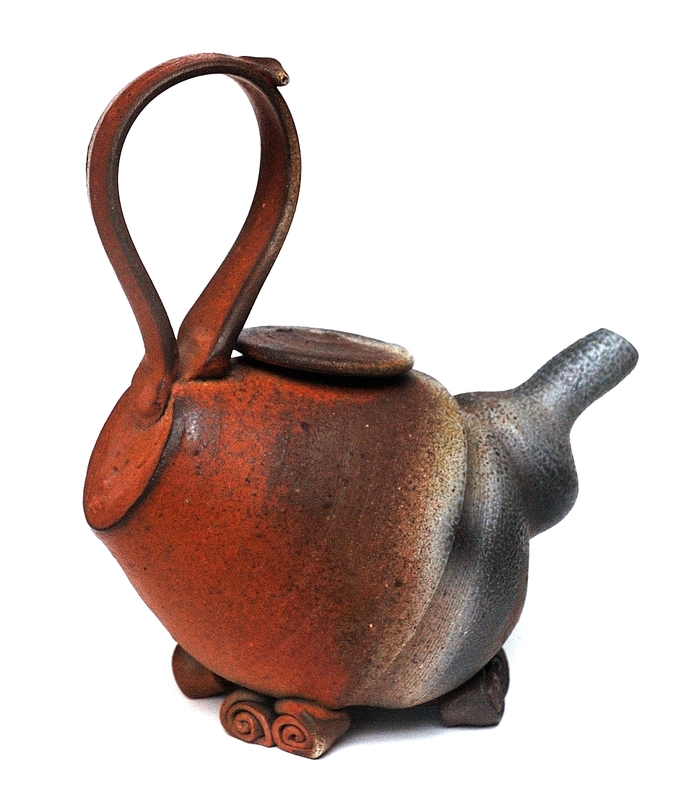 The Japanese art of repairing broken pottery with lacquer and pure gold. I have started to repair some of my more interesting failures using this technique. 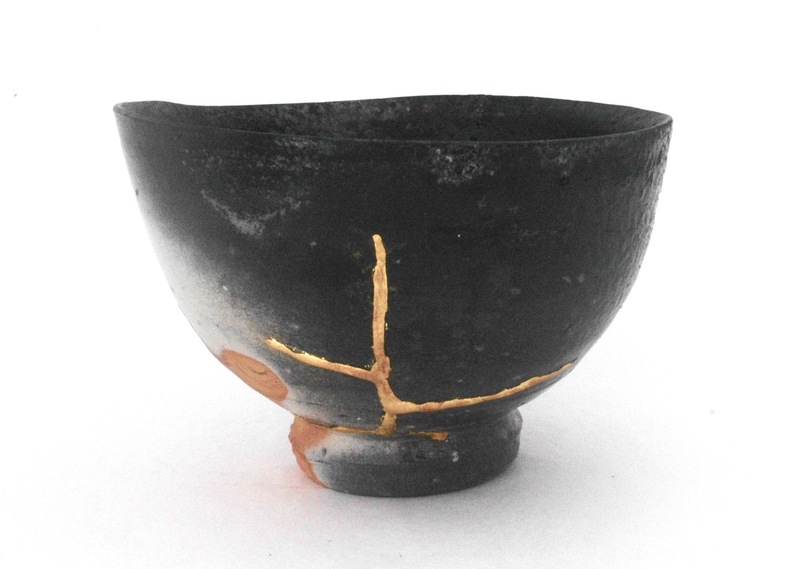 Kintsugi embodies three Buddhist concepts and makes them tangible. 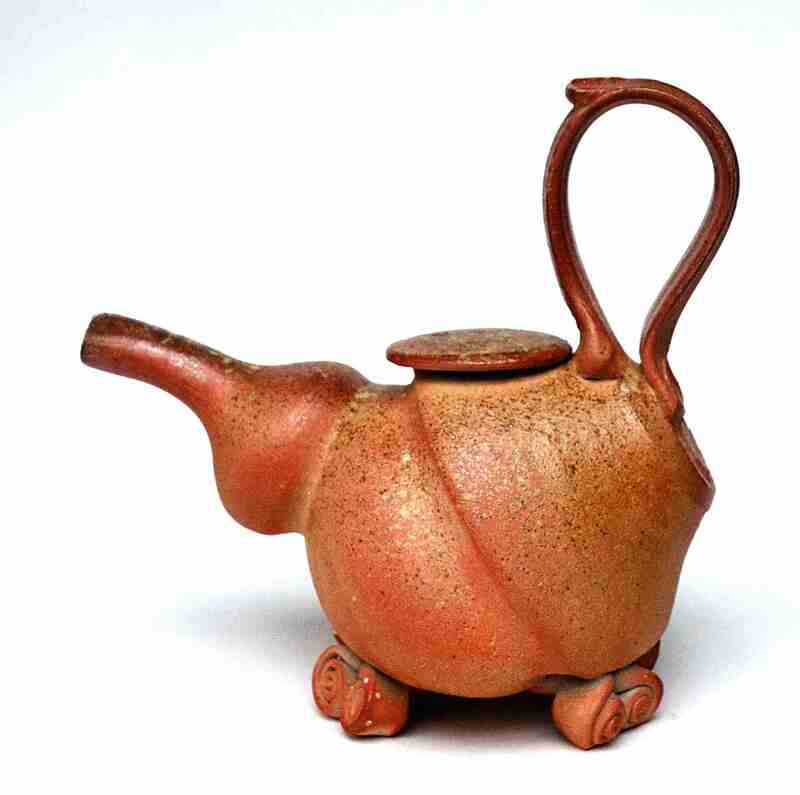 The first is ‘wabi-sabi’. Realising that something that is flawed and imperfect can still be extraordinarily beautiful The second is ‘mushin’, the concept of non-attachment and acceptance of change. Nothing is perfect, nothing lasts and nothing is ever finished. 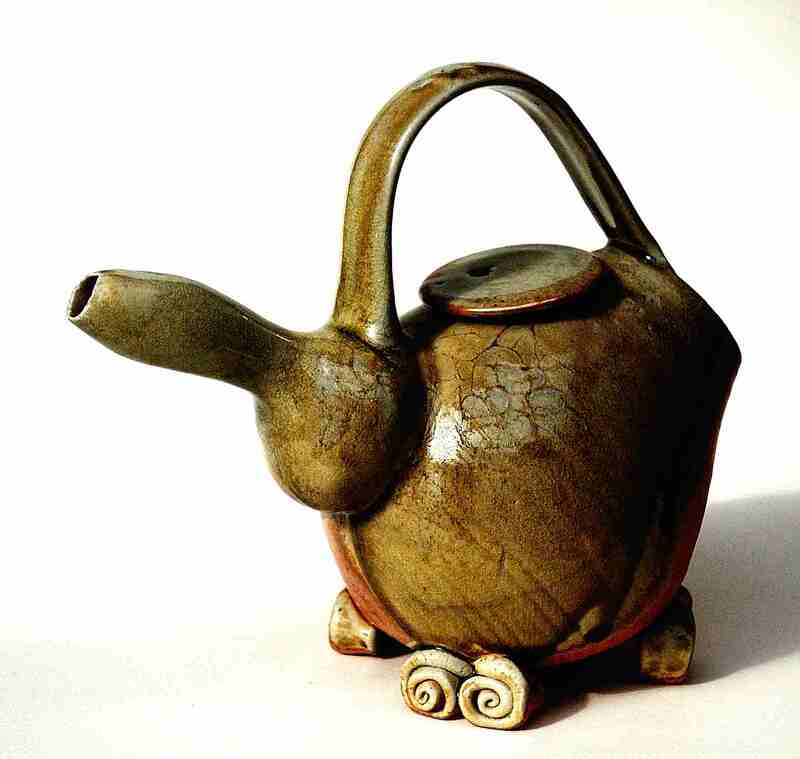 The last is ‘mono no aware’, a certain wistfulness at the impermanence of things. We are only here for such a short time together. Our transience is a reality of our life. Embrace the moment as it is. I feel that when I repair a beautiful pot that is broken, damaged or otherwise ‘non-perfect’ in a Western, conservative sense, I make it all the more beautiful. 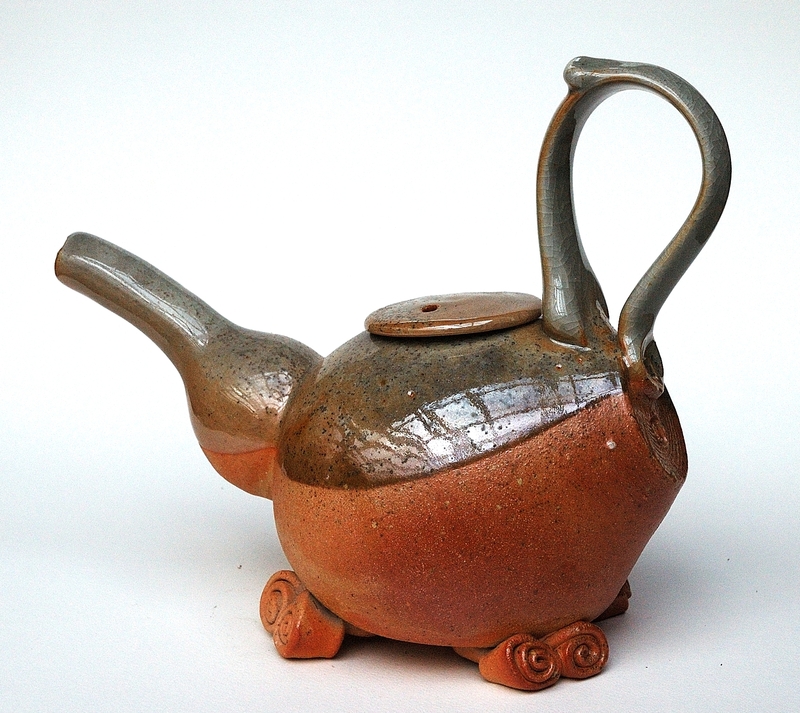 Spending time recovering and enhancing something that is otherwise lost, is a sign of great respect for that object. It fits well with my philosophy of minimal-consumption, self-reliance and making things last as long as possible. 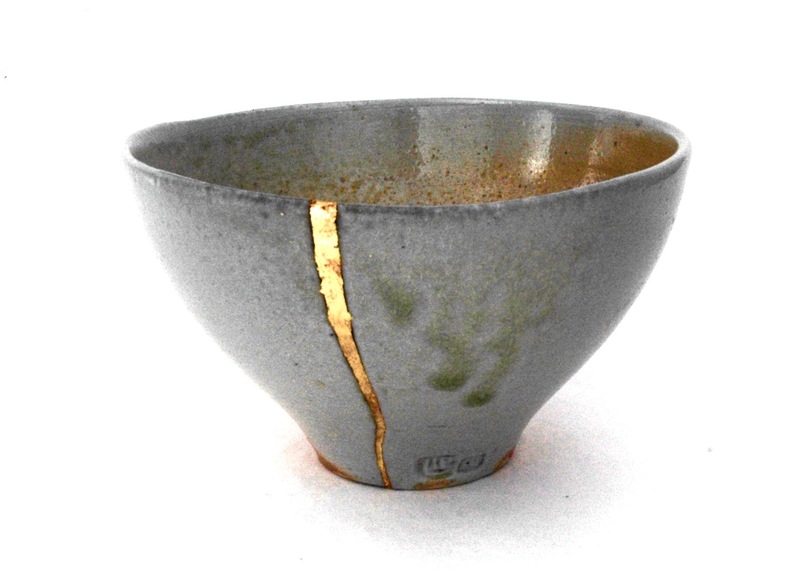 Because kintsugi has been called the art of embracing damage, it occurred to me that these, recovered bowls might be a suitable and beautiful metaphor for recovery from conflict. Hence my offering them for inclusion in this up-coming end-of-year show at Watters Gallery called ‘war’. I have very few ambitions in life. When I was young I decided that I would live in the country and to grow my own food, to make a creative life of some sort, build my own house, and live a self-reliant life. I have more-or-less fulfilled all of these modest ambitions. My lasting ambition is to make things that are meaningful, simple and modest. I go about this work of creating random acts of beauty without any regard to the effect that it may have on others. I am selfish, but not thoughtless. Our indigenous peoples have a long tradition of respectful collecting, gathering and hunting. 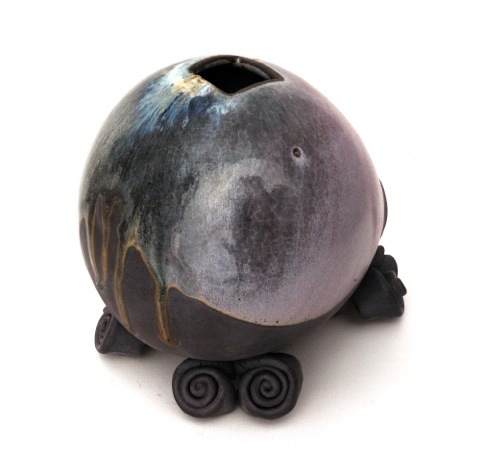 I feel that my small experiments interacting with the natural world, collecting stones to grind up to make my pots are compatible as a contemporary continuation/interpretation of this ancient practice. It respects place and biota. It’s 40 years since I moved to this small Village in the Southern Highlands south of Sydney. I’m pretty self-contained here. I don’t want for a lot, so I have everything that I need and I am grateful for that. My bowls are small, simple gestures. They appear to be empty, but are in fact full of good wishes and calm, thoughtful intent. The exhibition ‘War’ at Watters Gallery opens on Wednesday 23rd of November. 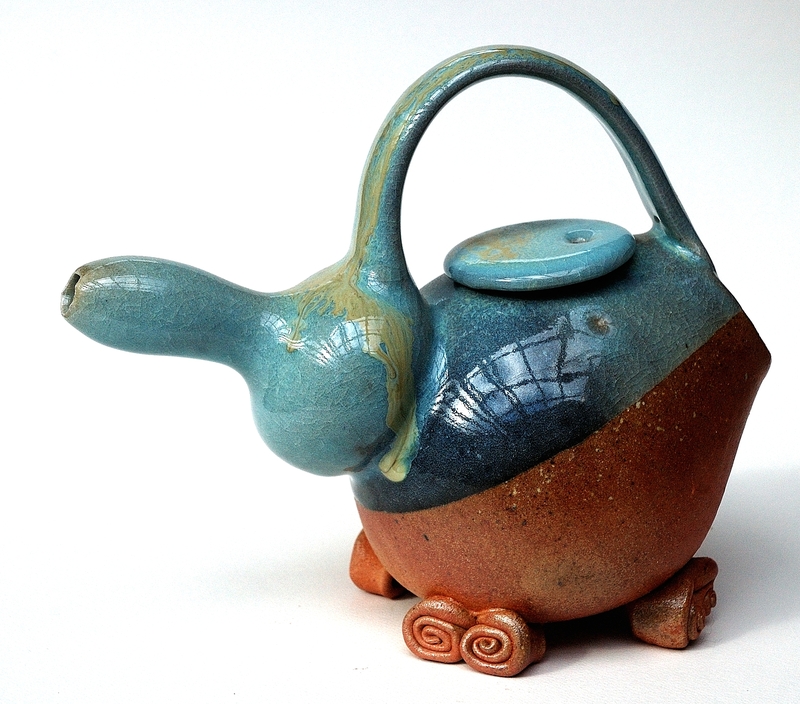 Friday June 3rd – The Glaze Makers, Kerrie Lowe Gallery, Sydney. 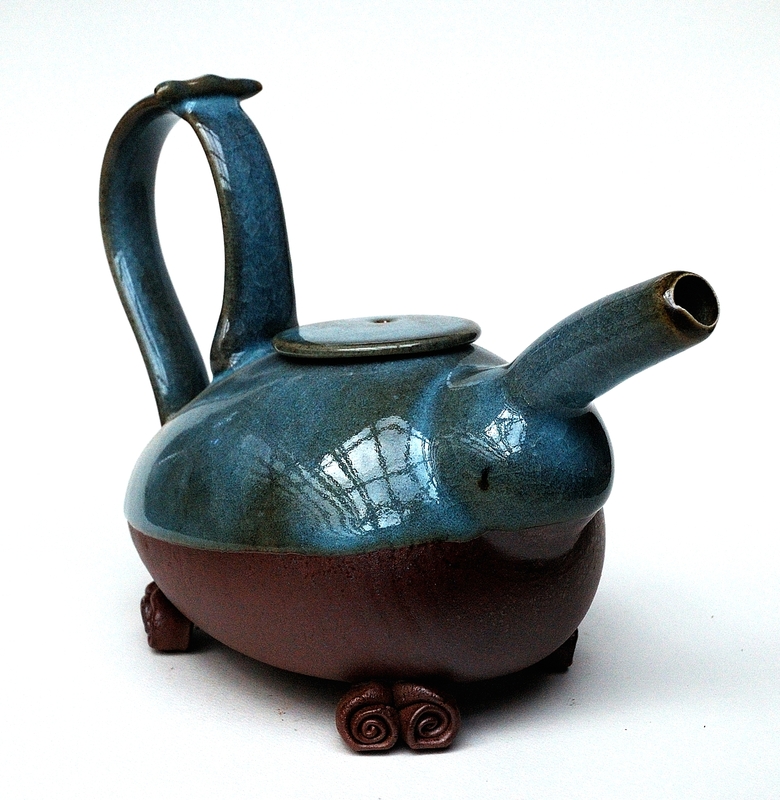 An exhibition of glazed wares by potters who make their own glazes. I will have 4 bowls in this show. The exhibition runs until 28th of June. This is one of them. 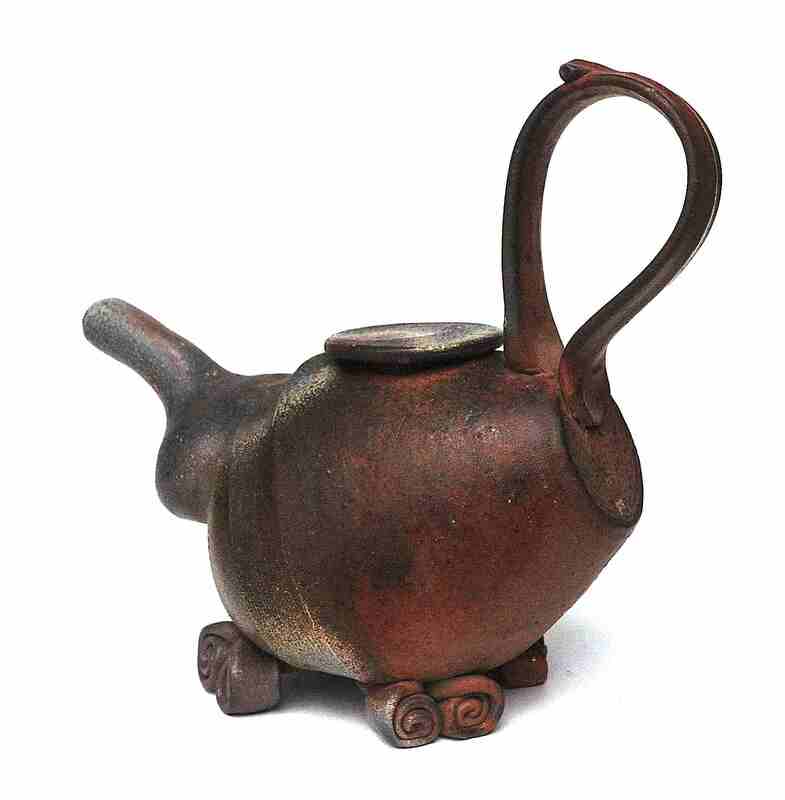 A iron stained, milled porcelain-stone body with a slightly opalescent glaze made from my local Bindook Porphyry stone. 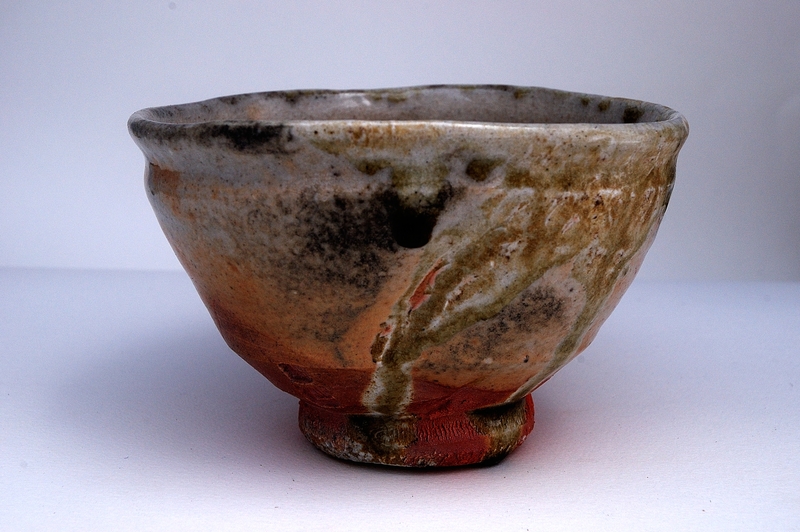 It has been wood fired and shows some carbon inclusion around the rim. 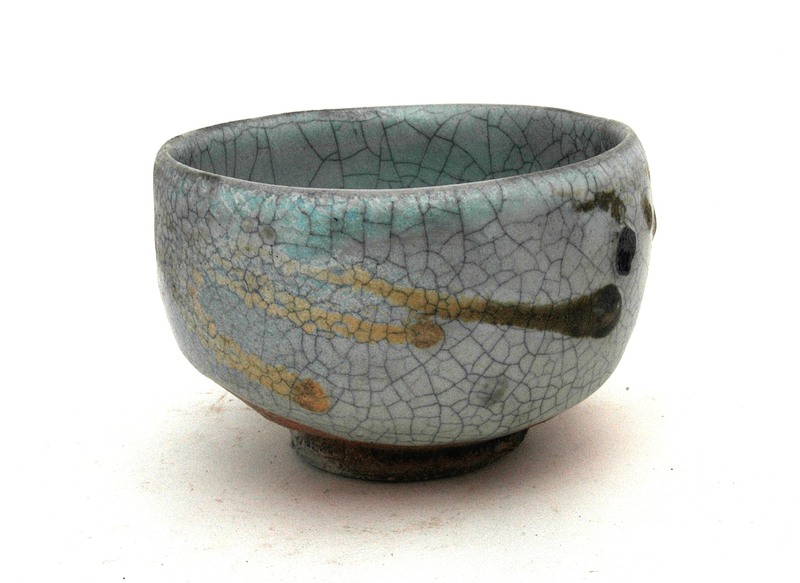 The natural wood ash deposit around the thicken glaze below the rim has created a slightly increased blue tinge to the glaze. There is some nice orange flashing of the exposed body around the foot. 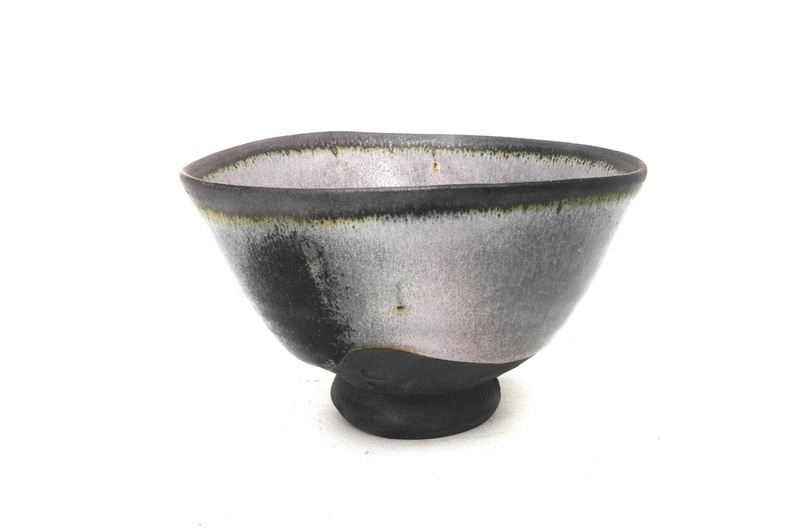 This bowl is glazed in a very soft grey satiny matt glaze. Beautiful to the touch. 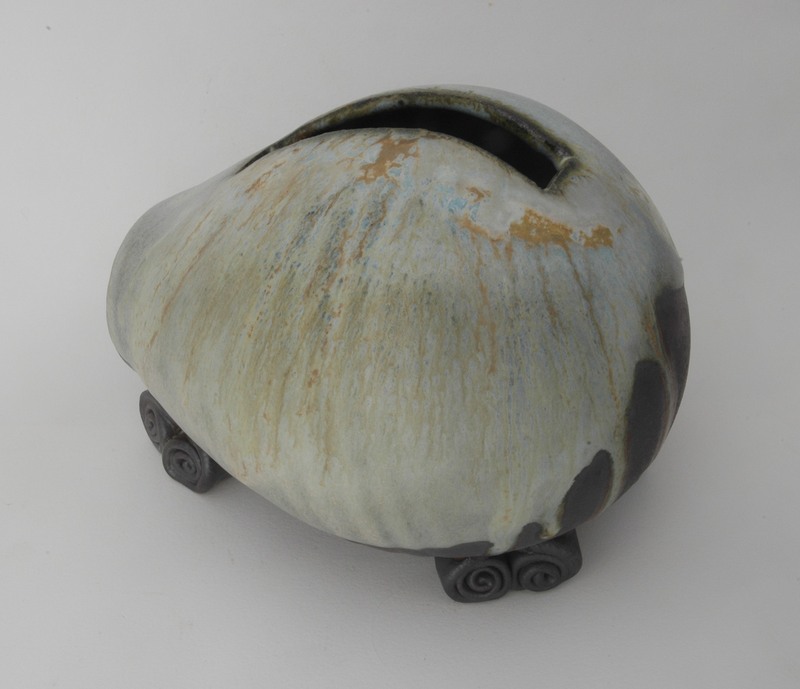 This is a very soft melted celadon glazed porcelain bowl with good translucency and a strong ash deposit on the fire face, with carbon inclusion on the rim and exposed body. May 2016. I have 3 of my unglazed, wood fired bowls in a show in Melbourne. Janine and I were both students of Peter’s at the old East Sydney Tech College, before it became the National Art School. Later, I worked as his workshop assistant at Church Point. We grew to be quite close friends, with Peter and Bobbie visiting us at our home here in the Southern Highlands. When Peter retired to Shipley, he asked us up to design and build his wood fired kiln for him. We eventually built 2 kilns for Pete at LeVar. Peter got quite involved with the ideas of self-sufficiency in his early years at Le Var and bought a book on the topic that he showed us on one of our visits. 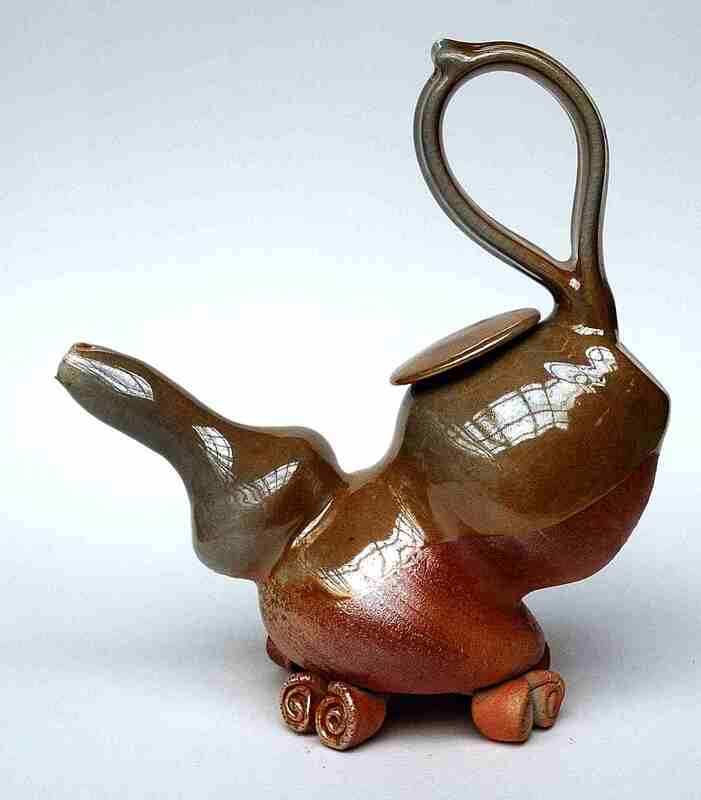 ‘Self Sufficiency’ by Sally and John Seymour. After dinner, we would all retire to the open fire in the stone room, Peter would read out long passages from the text. Janine and I already owned that book and were very familiar with it. 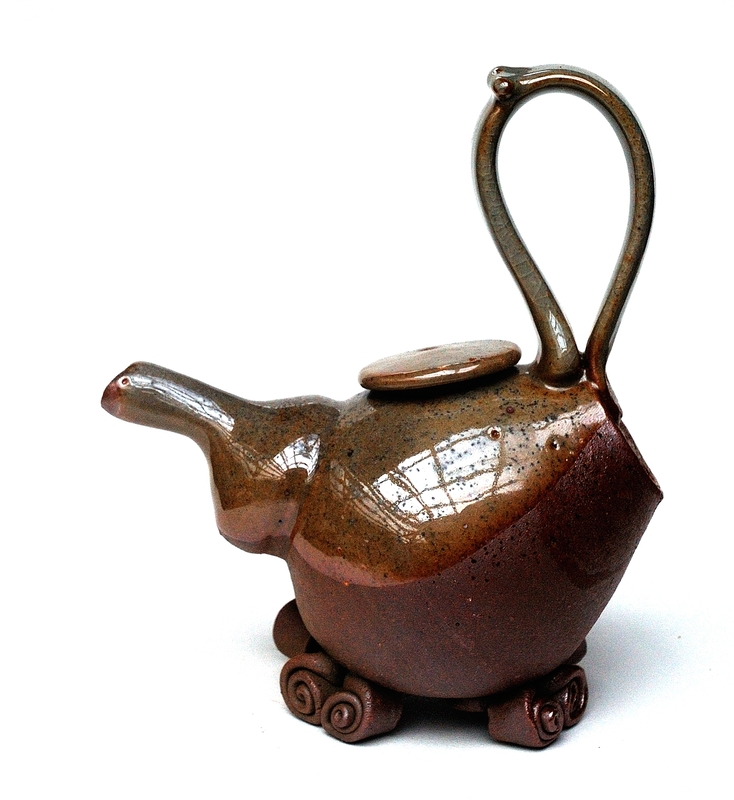 In fact we knew Sally Seymour quite well as she was a potter and had stayed with us in Balmoral Village, when she visited Australia from Wales, where she lived, the year before. It eventually transpired that when I went to Japan to study in ’86 Janine and Sally went up to Le Var to stay a while with Peter and Bobbie while I was away. So Peter got to meet her and to discuss his idealised beautiful country life as well hearing sally’s tales of the gritty reality of practical hands-on self-sufficient existence. My emotions, as I reflect on working and learning from Peter are complex. He was a very good person. I admired him and his contribution to Australian culture and society. He and Bobbie lived ethical admirable lives. They were a great example to us. When Peter retired to Le-Var, at 64 he started to take piano lessons. One of many conversation that I had with Pete, was about the importance of music in our lives. Now I’m 64, I have started taking cello lessons again. Some sort of coincidence? We discussed Bach at one point and I expressed the rewarding experience of listening to his cello suites. 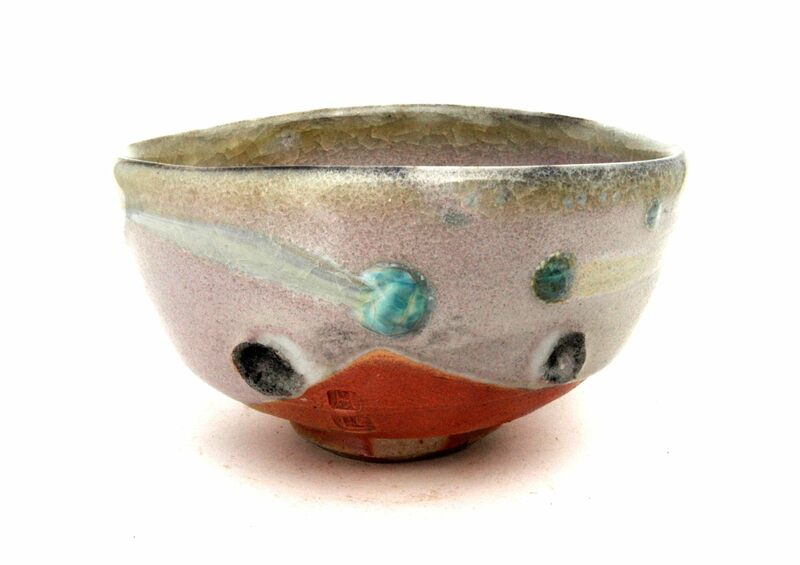 For this exhibition, I have selected 3 bowls that represent the 6th and final Bach cello suite, in D major. Titled ‘the bucolic suite’, It was Bach’s intention to represent the beauty of idealised country life, as Peter and Bobby had just begun to engage with the challenges and rewards of rural life at that time. It seems appropriate to use this suite as a metaphor. The D major chord comprises D, F# and A. These are white, black and white keys, respectively. With this in mind, I thought that it might be nice to show 3 of my bowls, two white local native porcelain and one my black washed basalt gravel. The larger bowl representing the tonic. 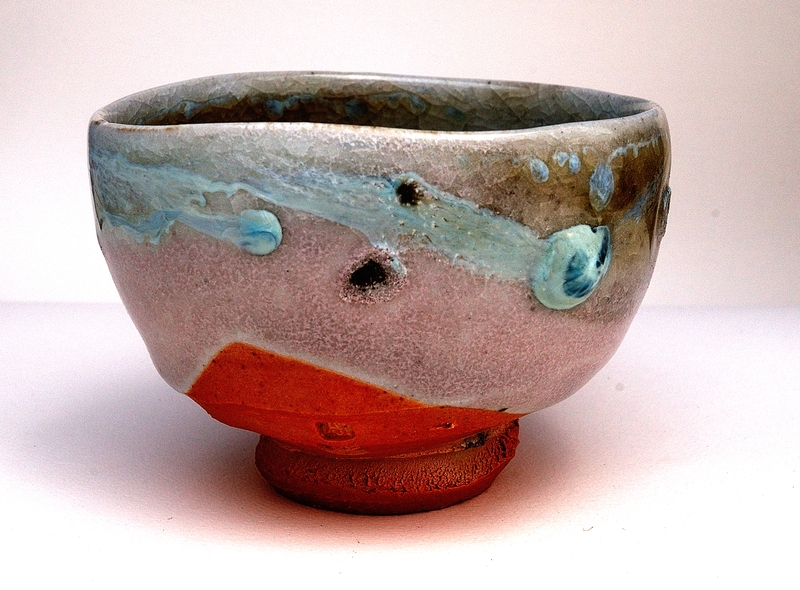 I have 3 new tenmoku bowls in the end of Year, Xmas show at Watters Gallery in Sydney. Opens Wednesday 2nd December until Saturday 19th December. I have been developing the Balmoral Blackware body that I make by washing rotten basaltic gravel in water then throwing away the gravel to obtain the micron thin film of hydrated ceramic dust off the surface of the rotten stone fragments. 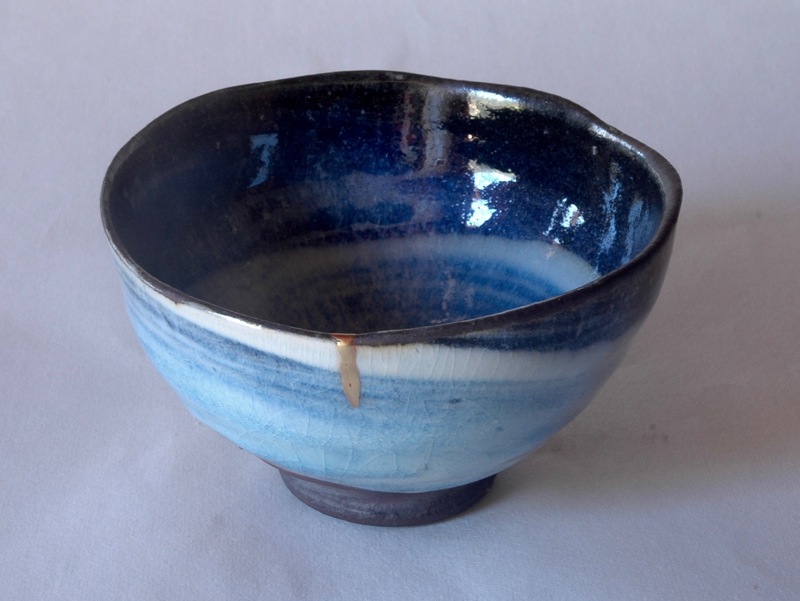 It takes a long time to prepare, as it takes quite a while to get enough sediment to settle out, so that I can stiffen it up into a plastic state and pretend to throw in on the potters wheel. I throw on an old fashioned, handmade wooden ‘Leach’ style kick wheel. I ‘throw’ the inside of the form and the rim, leaving the outside and the lower form quite thick, so that it supports the fragile, non-plastic material. After the forms have stiffened over night, I ‘turn’ away all of the excess material that was necessary to support the form from underneath, then shape the foot ring. 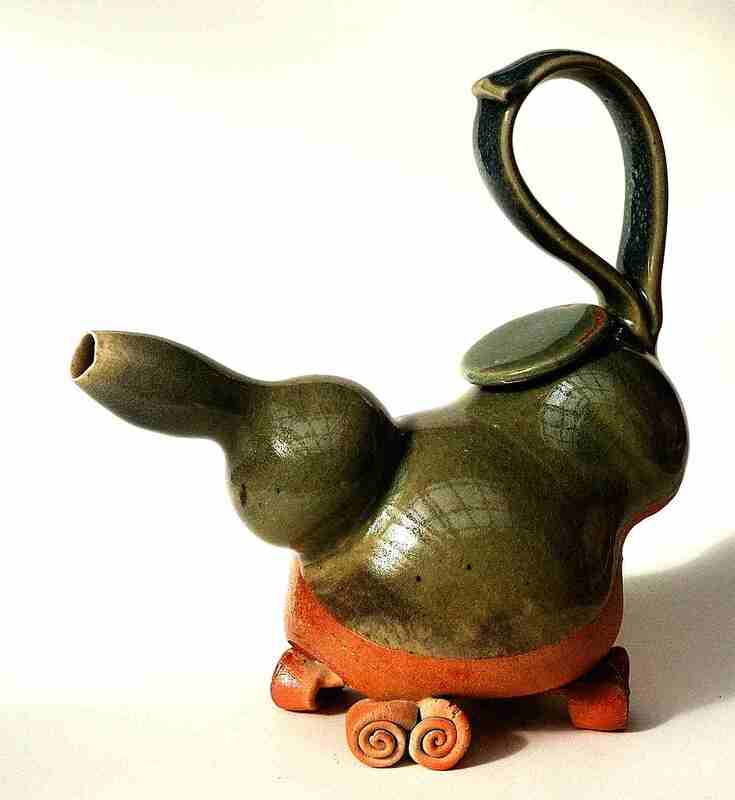 Turning away all the excess clay and revealing the form, the way that I had conceived it. I fire these forms at the front of the 2nd tier of kiln setting. If they are fired too close to the front, they melt. Quite literally, the extra heat is enough to make them turn to liquid sludge. I quite like it when they are just caught at their liquid limit, when they are just starting to melt. 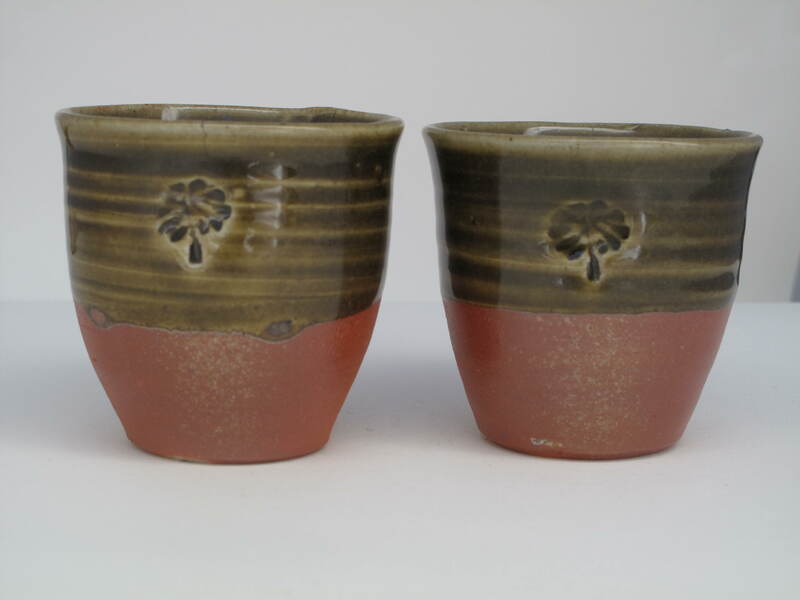 I particularly like the pots that are very slightly warped in the firing. Their endurance in the contest of the fire sometime brings about a lovely quiet, natural distortion in the precision of my original form that is very appealing. 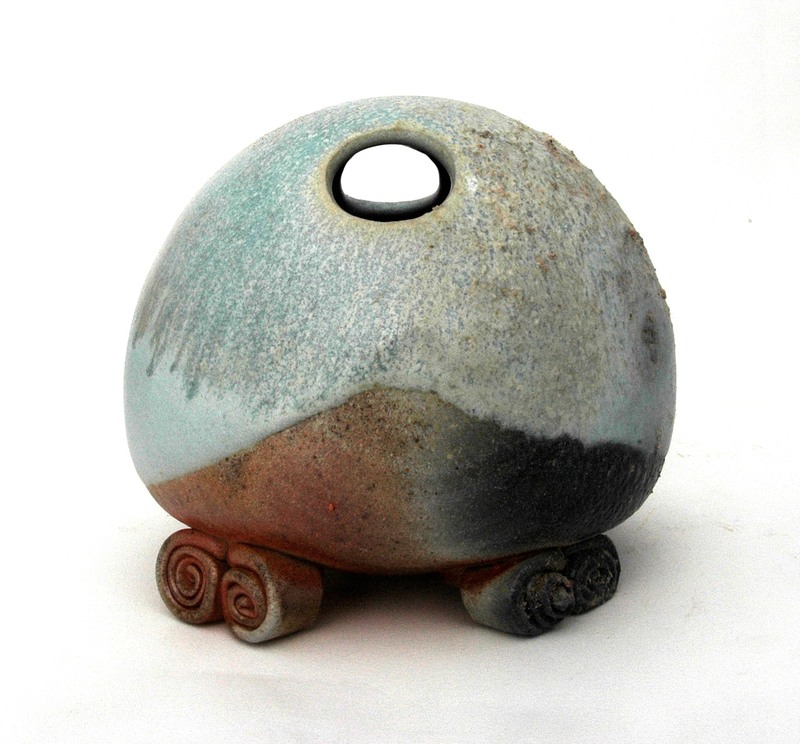 This piece below, has developed a gorgeous satiny surface of deposited natural ash glaze during the firing. The ash has soaked into the body and started to run down into a rivulet near the foot. It is almost invisible to see, but lovely to feel. The ash has also turned the mat black clay surface to ripe plum reddish brown. 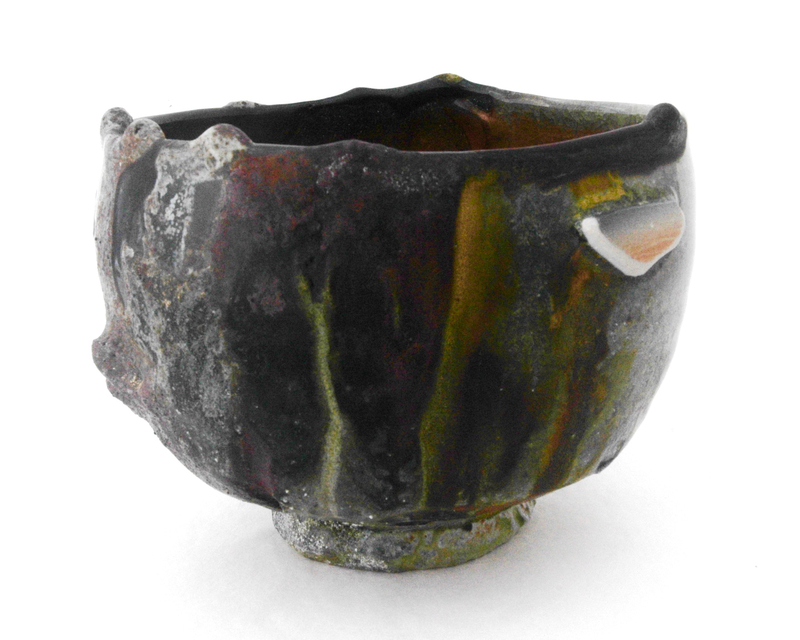 In developing the blackware forms, I have managed to achieve a couple of exquisite pieces that really exemplify the potential of this material. I have also been spending a lot of time in working on my native bai tunze stone materials. 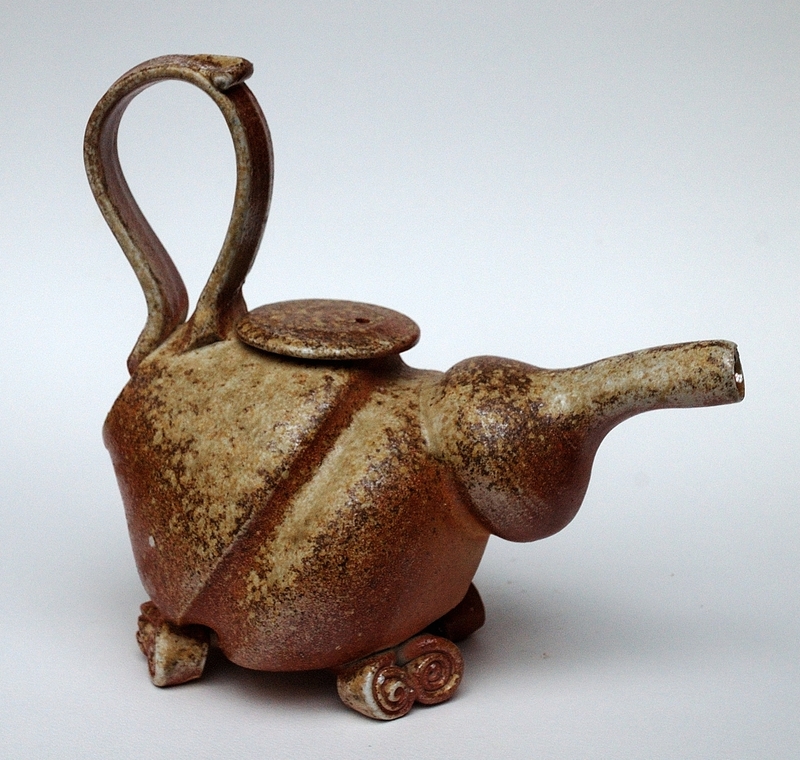 I spent time both in China and Japan this year trying to extend my understanding of single stone porcelain. These initial results are very encouraging , and I feel that this work is starting to pay off. 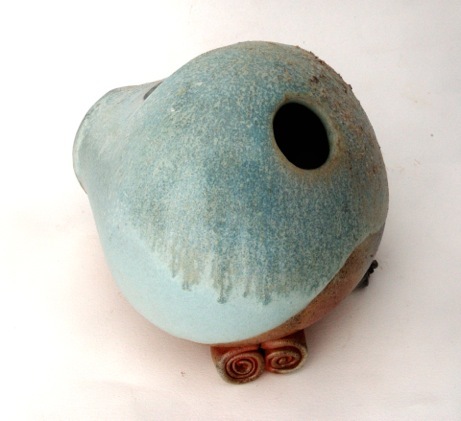 This form above shows a build up of natural ash glaze deposit that was built up during the firing. It is slightly greenish in colour where it is thicker and there is a very delicate grey/black carbon inclusion trapped around top of the rim. It defines the rim and completes the form. 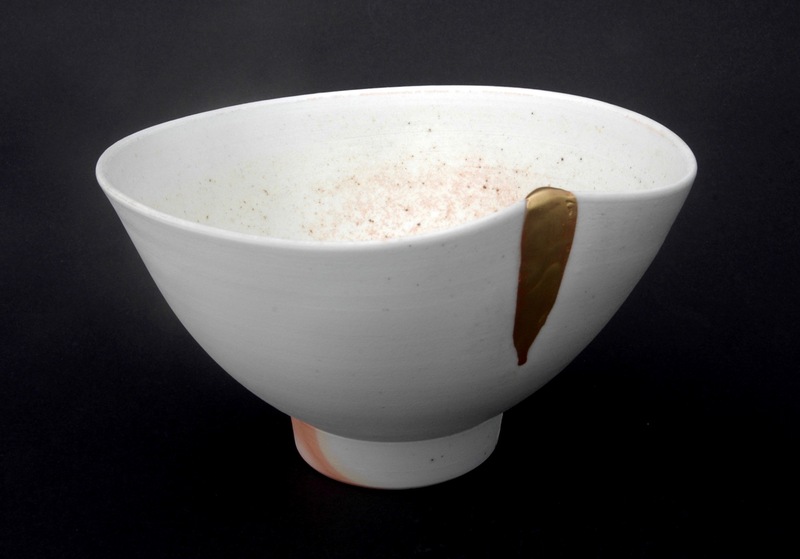 I have this piece of single-stone white, unglazed porcelain in this show, it is quite subtle and delicate. 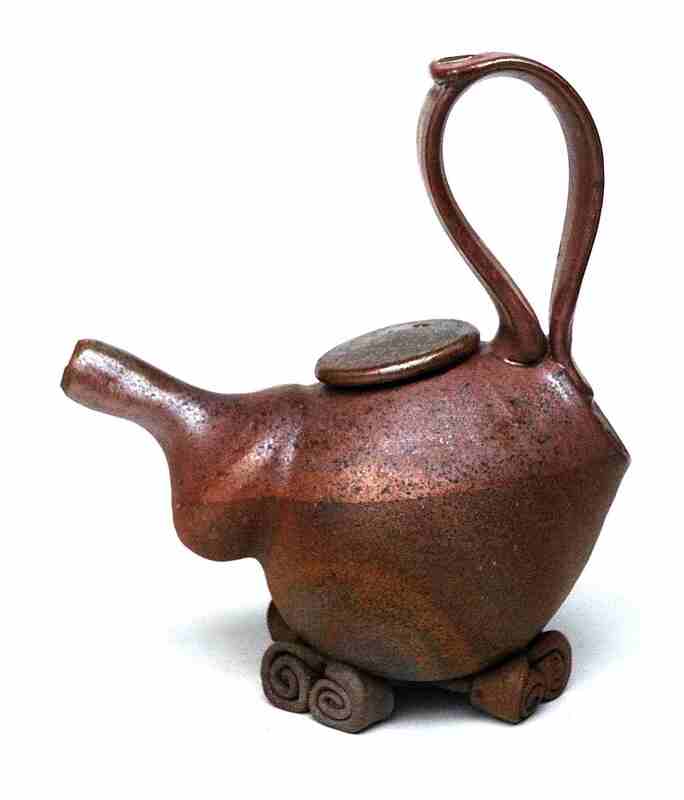 I have explored both high footed forms as well as seemingly footless forms like the traditional ‘tenmoku’ forms. I was lucky enough to spend time in China earlier this year, studying both single stone porcelain as well as a trip up-river, in China to study the ancient ‘tenmoku’ ware sites. 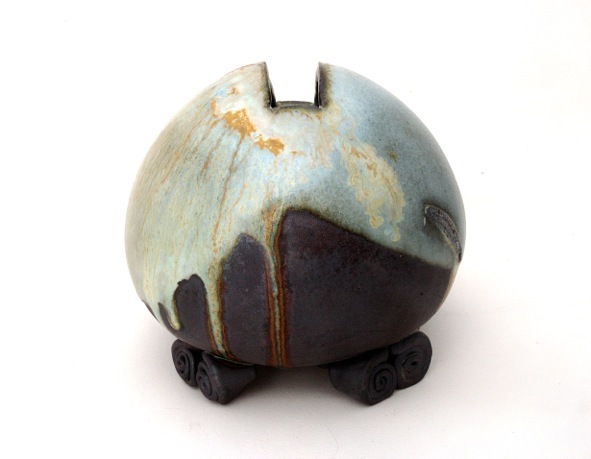 These pieces are are both translucent and made from 97% ground native porcelain stone pastes. The remainder being 3% sticky bentonite clay. This helps ‘glue’ all the stone fragments together so that they can be ‘thrown’ on the wheel. 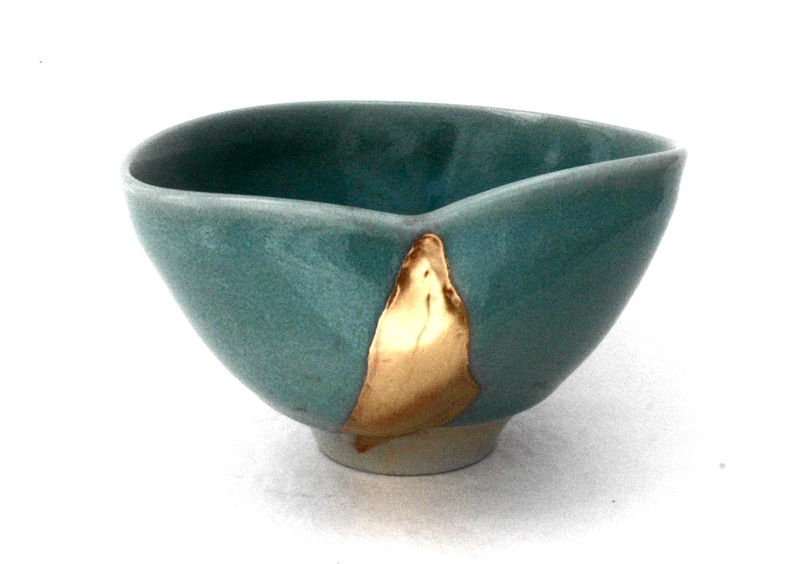 What I do isn’t really ‘throwing’ as most potters know it, but rather a soft, gentle, patient, kind of coaxing the ceramic paste into the bowl form. I also brought out some ‘archival’ batches of iron stained porcelain stone body. This time I have used a batch of body that is made from all the iron stained fragments of bai tunze that I hand sorted from the larger batches and threw aside. After a while I realised that I had separated enough yellowish, iron stained material to make a 5 kg batch of irony body. This clay is still translucent, but only just so. It has a lovely warm, mellow reddish/brown blush to it that is so warm and inviting. 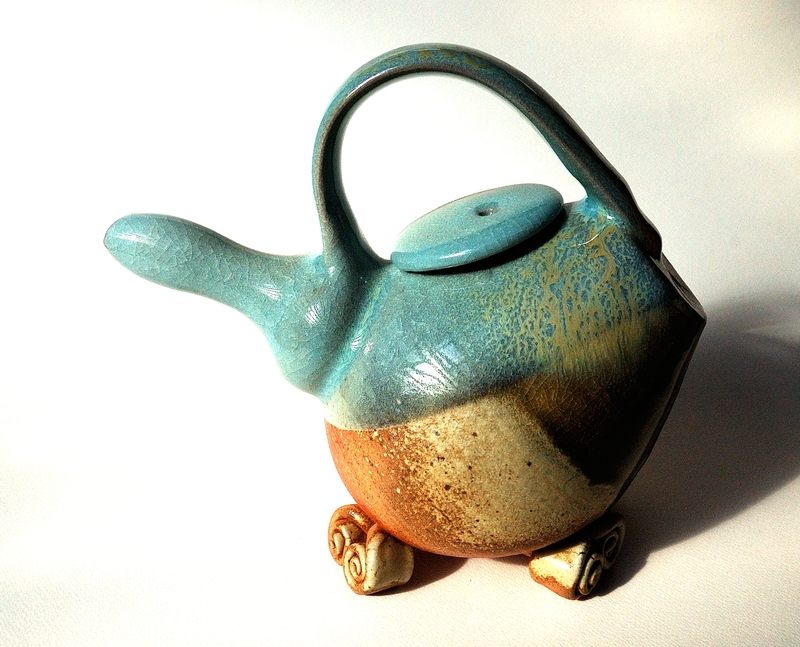 I have made some experiments this year with adding some salt to my feldspathic glazes. 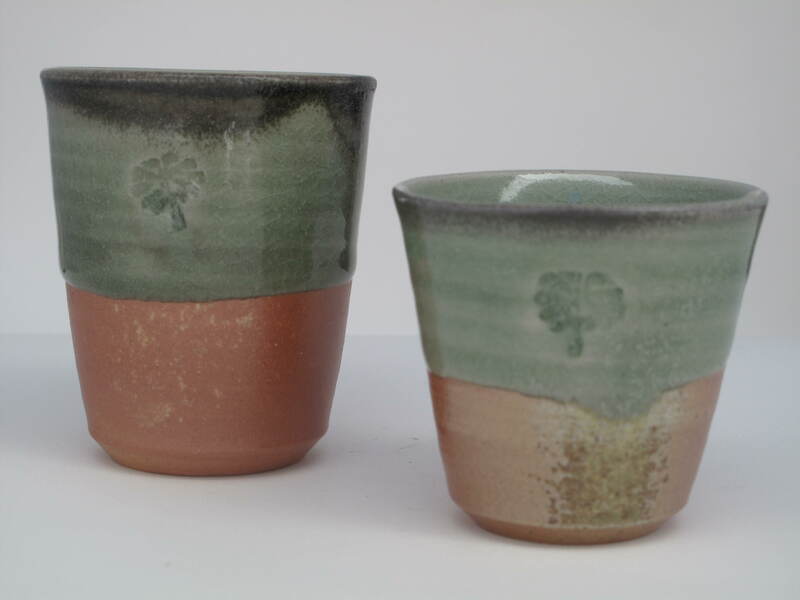 Instead of turning out the usual, yellow, orange, pink, brown colours, these recent firings have resulted in a few pieces that are defined by their total carbon sequestration, turning the glaze almost totally black. Except for a small area of grey/white down low near the exposed clay foot. This carbon glazed tenmoku form has turned out better than I could have imagined. 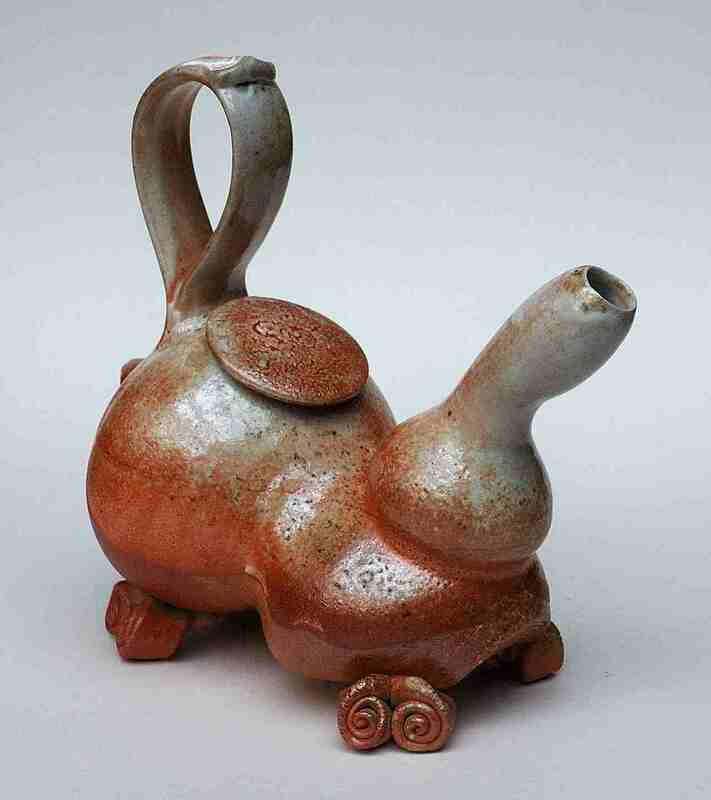 In October ’14, I will be showing these Ikebana vases in Taiwan. 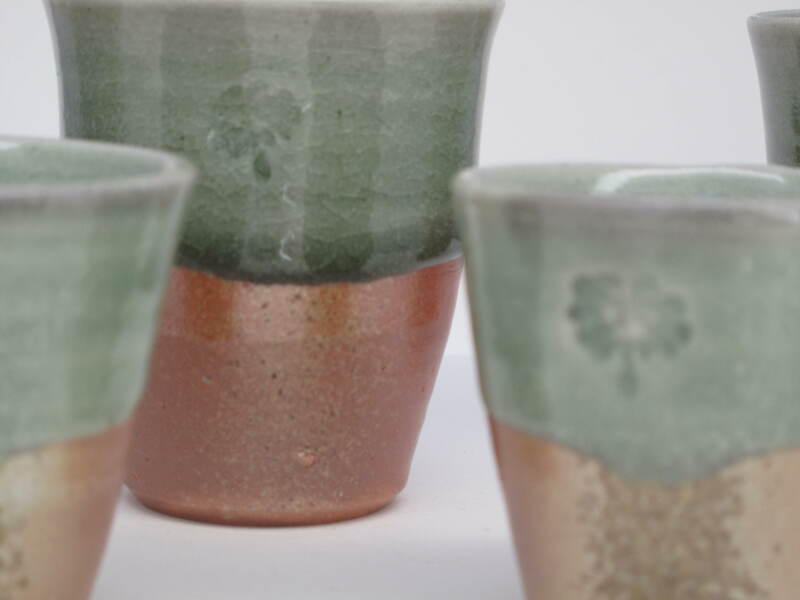 In September I will be taking part in the 18th Chawan Expo in Singapore. 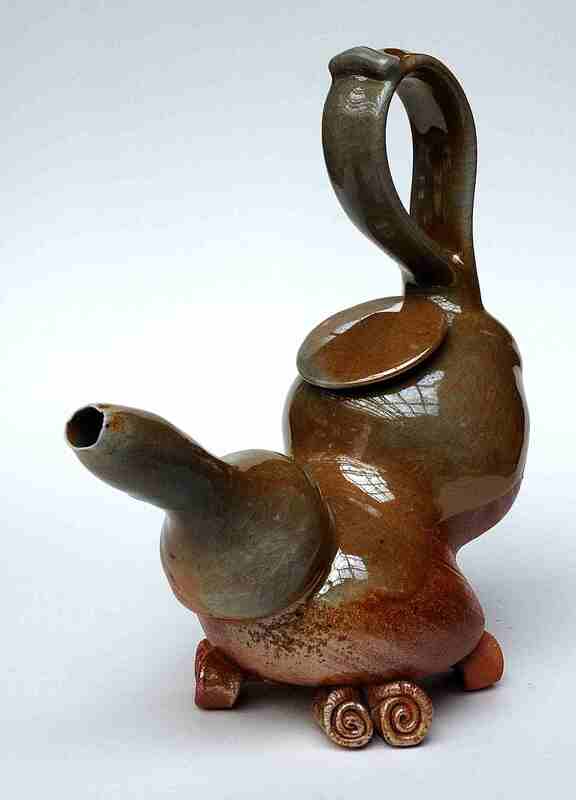 I will be showing 3 pieces that I feel are suitable for use in “Tea”. 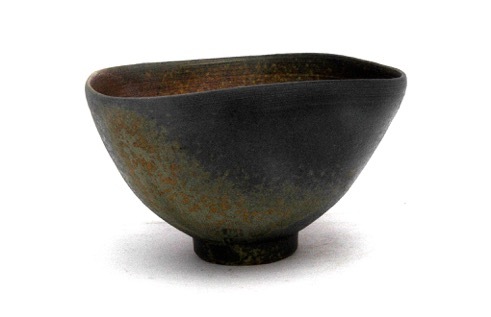 In August i will be showing some wood fired ‘shino’ inspired tea bowls at the Kerrie Lowe Gallery in Newtown, Sydney. 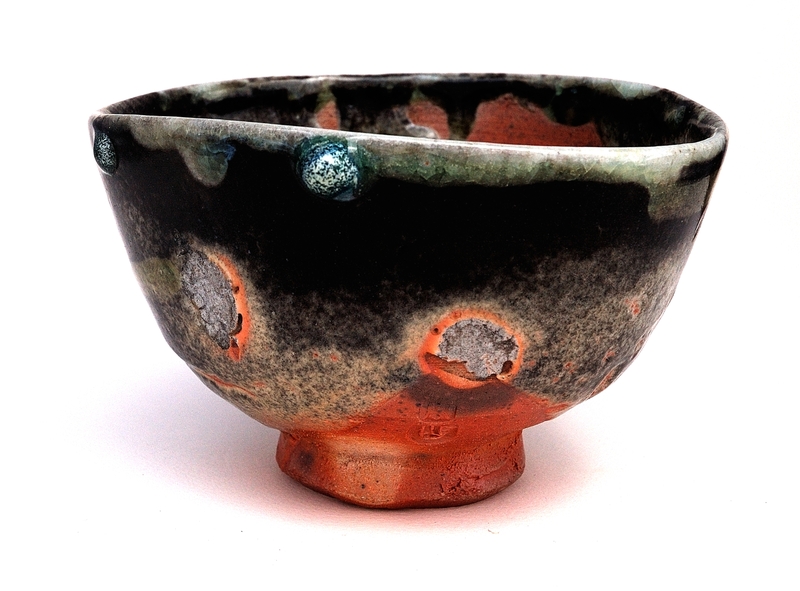 I will be exhibiting these two bowls shown below, at Anna Maas’s Skepsi Gallery Exhibition at Montsalvat, Melbourne in August. 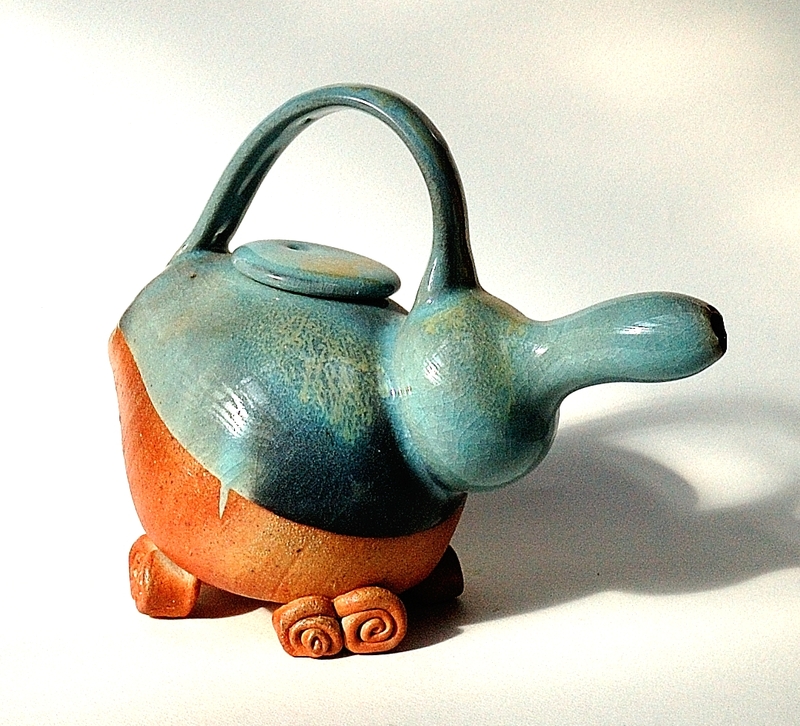 These are some of my recent Teas Pots. 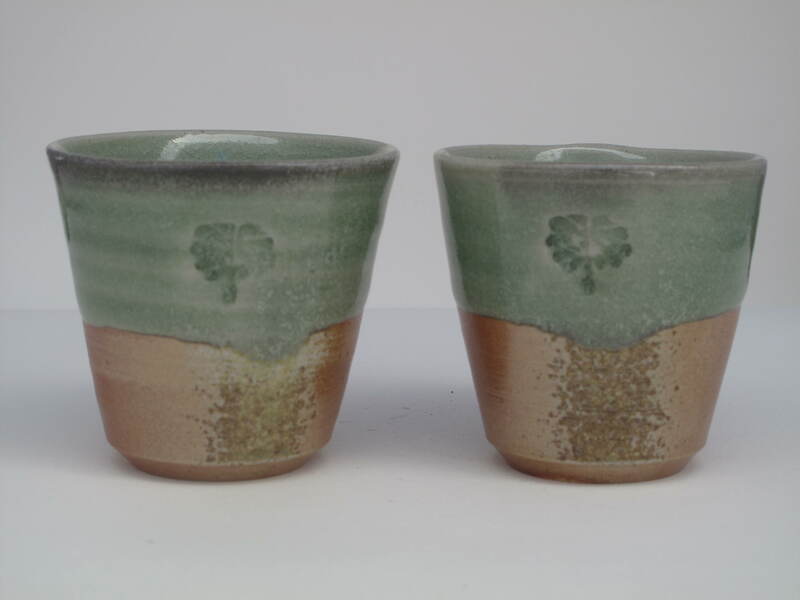 I will be exhibiting a few of these along with Janine’s little cups at the Kerrie Lowe Gallery in Newtown , Sydney. 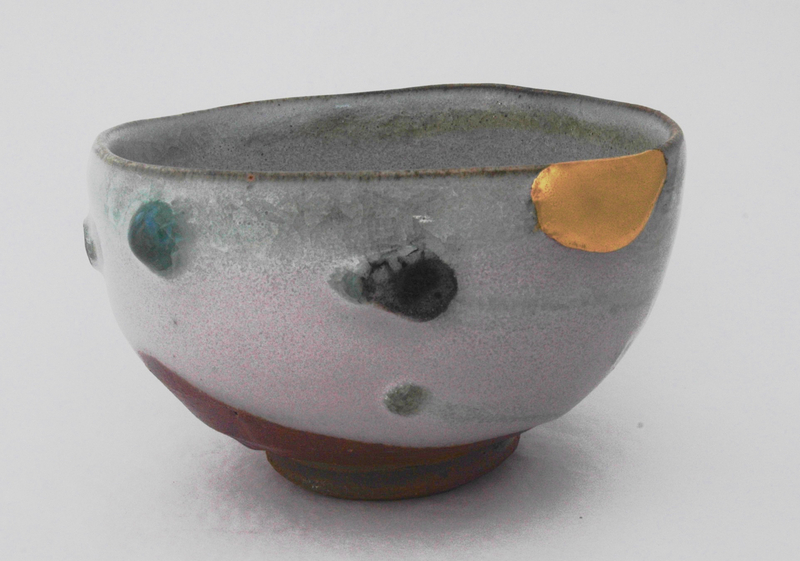 The bowls shown below are among the 8 pieces that I will be showing at the Manly Art Gallery and Museum from 2nd May 2014 through to 8th of June 2014. 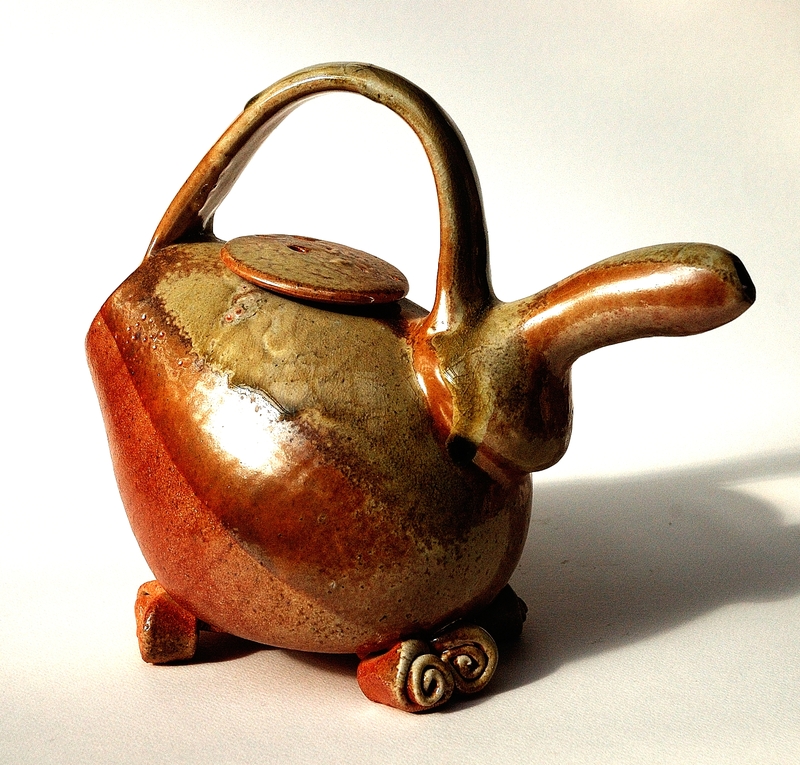 The Course of Objects – The fine lines of Inquiry. 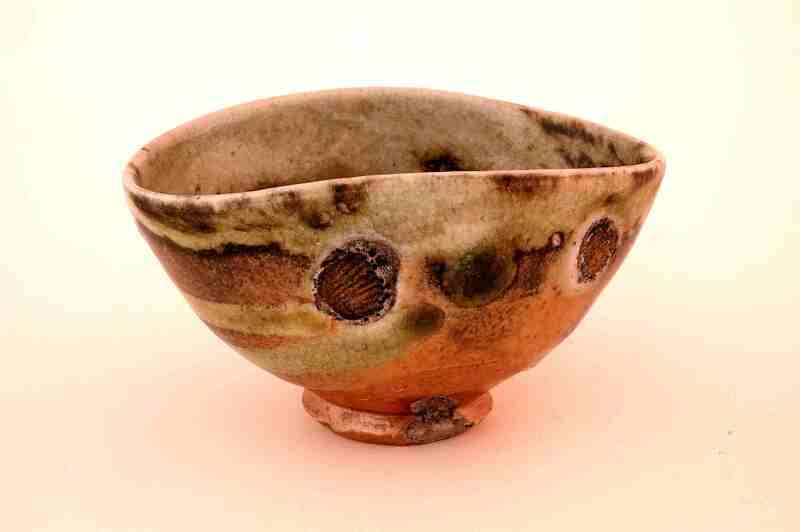 The bowls below are part of a Group show to coincide with the international woodfire event; ‘On the Edge of the Shelf’. These pieces will be shown at Ivy Hill Gallery from 2nd May to 9th June 2014. in a show called ‘From the Book’.